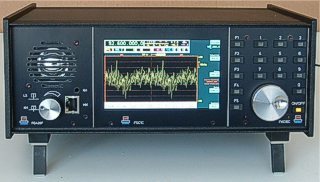 The measurement and communications receiver RDR54 can be flexible configured for many purposes in the range of 0 Hz up to VHF. 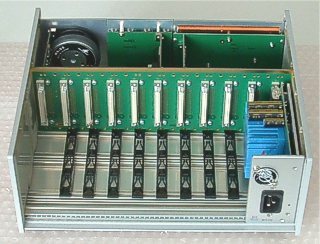 The device consists of a basic unit (Mainframe RMF22) with bus board and pluggable modules. Modules can be inserted from the front and the back. 11 slots are available, one per inch (25.4 mm). This is the smallest possible module width, larger modules are multiple times wider. With 3.15 inch (80 mm) module height and 3.7 inch (94 mm) front panel height, the RMF system is considerably more compact than similar 19” systems. Layout and equipment are EMC-compliant designed (conductive surface finishing, contact strips, shielding...). Casing (AI profiles / milled side elements) and front modules are available in AI grey or black, back modules are always anodised in aluminium. Customer specific modules for special tasks can be manufactured. The RDR54D can be upgraded to a RDR55 via an upgrade kit. Older devices (version C) potentially need additional modules (front audio module FDA20F). The RMF system has a proprietary operating system (real-time multi-task / multi processor) at its disposal, for cross-linking the modules across various data interfaces. It implements the functionality of a digital receiver with very fast graphic representation (spectrum, operation) into the RDR54. With the corresponding modules, a transceiver expansion is possible. You can find out more about the RMF 22 system here: RMF-Bus(german). Extensive description of the RDR54 since redevelopment: Digital-RX (german). The RDR54 is currently available as RDR54D1. Delivery takes, depending on equipment, a few days to several weeks. The RDR54 is no longer in production! The other specifications for the RDR54 are the result of the used modules and the software. Please consult the current documentation.